- by using the plastic deformation property of lead, it absorbs and scatters earthquakes energy. - It can restore its original position after earthquakes are stopped. No additional repair or maintenance required. - LRB is the most frequently used bearing for earthquakes. - From the functional perspectives of a bridge, it supports excellent design of a continuous bridge. - the lead molecules that experience earthquakes revert to the original molecular structure at room temperature. - Due to the features of lead, it has high resistivity against winds or braking load (short-term weight) to improve the usability and less temperature ability (long-term weight) is applied. - LRB can improve flexibility in your design by arbitrarily adjusting the weight and reducing power for each bridge characteristics. 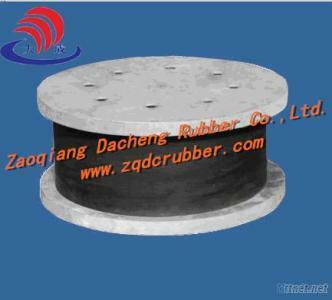 - the reverting power of rubber does not generate residual displacement after earthquake. - LRB is a kind of rubber bearing, it absorbs shock loads to improve the durability of the structure and it is advantageous in the noise. the rubber in the isolator acts as a spring. It is very soft laterally but very stiff vertically. the high vertical stiffness is achieved by having thin layers of rubber reinforced by steel shims. These two characteristics allow the isolator to move laterally with relatively low stiffness yet carry significant axial load due to their high vertical stiffness. the lead core provides damping by deforming plastically when the isolator moves laterally in an earthquake.